Is it really January 3rd already? That’s at least a day later than I hoped to be sharing the year’s first new recipe with you. But I think you’ll forgive me, when you see what a special one it is. And when you realize that these extra few hours of waiting come with an added bonus. This is the time when anyone reading this via email or in a reader should click on over. Do me a favor, just this once, mmmk? Of course, those of you already here know what I’m about to say: this is not only my first recipe of 2012, it’s the first recipe on my newly designed blog! For the past few months, I’ve been working with Lindsay of Purr Design to come up with a design that combines a bit of glitz, a shake of glam, and a lot of girl for something that’s uniquely Cara’s Cravings. I wanted my new site to convey the same things I strive for in my recipes: creativity and cleanliness. Thank you, Lindsay, for this gorgeous design! It goes without saying that the justification of a whole new site would have been a mere dream without you, my loyal readers. In fact, I did it as much for you as for me, so that you have a better experience when you come to visit. What exactly does this mean? New recipe formatting – pretty and printable! This will be automatic for new posts. I would love to have all the time in the world to go back and update the old ones, and maybe I will someday. I wish I had a teenage cousin looking for some extra bucks. But right now I have neither – so please bear with me. A simple comment form makes it easy for everyone to say something, no logging in to anything required. Magazine formatting – this means that each time you visit my homepage, you’ll see a large snippet of my latest post, with smaller thumbnails and short descriptions of more recent ones. No scrolling, and scrolling, and scrolling…. Social Networking via customized buttons (see them up there, top right?) so you can find me. Anywhere and everywhere. Almost. If Facebook, Twitter, RSS Feeds and Pinterest aren’t enough, well, we can chat privately. More, more, more. Eventually, there will be more pages up at the top where I’ll answer frequently asked questions, give you essential tips and tricks, and recommend reading material. These will be a work in progress, so stay tuned! Now that we’re all on the same page, it’s time to party. What better way to celebrate a blog makeover than a recipe makeover? I know, right! No, we don’t forget about them. We just go ahead and make them better, so we can all enjoy them with a lot less guilt. Loves, I hope you’ll raise a brownie and join me in celebrating the brand new Cara’s Cravings. Preheat oven to 350ºF and line an 8×8″ baking dish with parchment paper. Place the dates in a bowl and cover with piping hot water. Let sit while you measure out the remaining ingredients. Weigh the dry ingredients (sorghum flour through psyllium husk powder) into a bowl and whisk together. Place the applesauce, pumpkin, maple syrup, and vanilla extract to the bowl of a food processor. Drain the dates and add these as well. Process until smooth, about 3 minutes, stopping occasionally to scrape down the sides of the bowl. Pour the dry ingredients into the food processor bowl and process to combine, stopping to scrape down the sides of the work bowl if necessary. In a blender, combine all ingredients for the pumpkin cheesecake layer and process until smooth. Scrape the 2/3 of the brownie batter into the prepared baking dish. 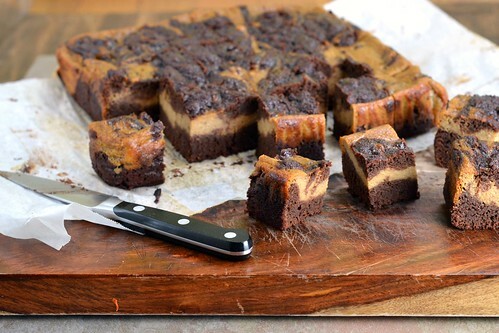 Top with the pumpkin cheesecake batter, and spoon dollops of remaining brownie batter on top. Draw a knife back and forth through the batters to create a swirl pattern. Bake for 50 minutes, or until a toothpick inserted in the center comes out with just a few moist crumbs. Cool thoroughly before slicing. This recipe is linked to Wellness Weekends at Diet, Dessert and Dogs and Slightly Indulgent Tuesdays at Simply Sugar and Gluten Free, two of my favorite healthier recipe roundups. Love the new look! Love it! Love the new layout! So pretty and so much easier to browse thoughtout the whole blog (not that before it wasn’t). The blog looks great! I love how we were just talking about it! You know I’m a big fan of these brownies. I’ll have to try the makeover recipe too. I love the new site! It looks great and is very user friendly. These brownies look fabulous too! love the new layout!! 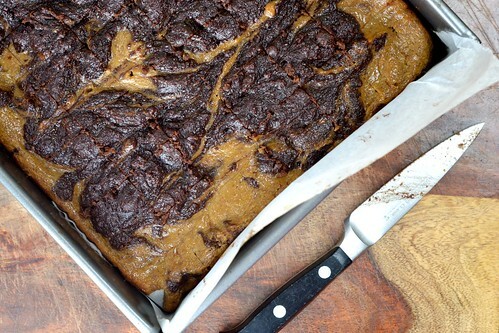 and these brownies, how is it that you’ve turned a great recipe into one that’s even better?! Love the recipe and new blog look! Happy new year! Happy new year and thanks for all the great recipes. So glad that Lindsay was able to work with you! It look great, and I love all the purple. It’s so you! The new site is SUPER fab, girl! It really is girly and glam and SO you! I’m currently in the process of having mine done over and making the switch to WP…and you’ve gotten me super excited for it! These brownies are helping too. You know how I feel about pumpkin. And chocolate. Swoon. LOVE the new look!!!!! And I always love your pumpkin brownies! The new site looks lovely – love it! I’ve made your original brownie recipe before and yes, it was delicious 🙂 This version looks perfect for your new diet. And also, i LOVE the new design. Perfect for the blog! Cara, the blog design is gorgeous. Just the perfect amount of glam. I love it. 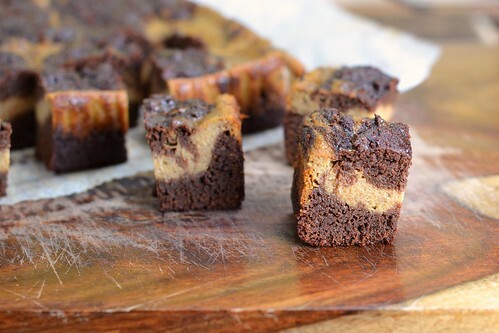 And these brownies?? Holy moly, girlie! They look DIVINE! I will be making these at some point in the very near future!!! looks fantastic! i knew exactly who designed your blog too when i popped over. Purr has fantastic designs! Looks really great! i love the new blog look! so pretty! Congrats on the new design. It looks like it absolutely lived up to your vision. 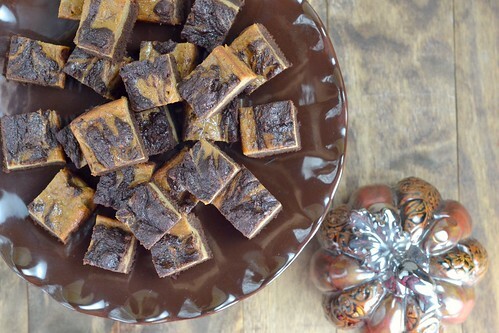 The blog looks wonderful and so do these brownies! Do you think rice or coconut flour could be subbed for the sorghum? Thanks Laura! I can’t say for sure since I haven’t tried it, them but I think rice four would be ok. Spelt flour would be good if you can tolerate gluten. If not, a gluten free flour mix works work too. I wouldn’t do coconut flour, the consistency is different. Good luck and let me know if you try them! I love the new comment form and those brownies only have 2 grams of fat? Talk about feeling good eating sweets. I have most of these ingredients so I know I have to try them. Awww why can’t I pin your beautiful GF/DF/Vegan recipe for later reference?